Home shoppers often assume they’ll be able to look beyond empty rooms or ugly decor to find the true potential of a property. Unfortunately, in reality, they rarely can. That’s why new construction builders rely on luxuriously finished model properties to sell buyers on homes that haven’t been built yet. And it’s also why so many real estate agents tell their home seller clients to invest in home staging. Despite the obvious advantages of providing potential buyers with the visual suggestion of the lifestyle they aspire to, many sellers wonder if home staging really makes a difference. The answer is a resounding yes -- if it’s done right, of course. Here are some expert home staging tips that are helping Denver home sellers get more money for their homes right now! Not sure where you should begin? Sprucing up interiors is a must for any home sellers, but home staging isn’t just about living rooms, dining rooms, and kitchens. Realistically, home buyers are going to make up their mind about your property within the first 30 seconds of a visit, maybe a minute if you’re lucky. They might even know whether they’ll buy or not as they walk up to the front door. That makes exterior spaces just as important as interiors. Trim foliage, remove dead plants and old mulch during growing season and add external lighting. That’s an easy DIY home staging action plan to get started with. Targeted staging is the new paradigm. Specific design aesthetics can be crafted to resonate with a particular audience of buyers looking at your home. Whether it’s industrial, hipster, classic, or modern, fitting the right style to the right audience can help you gain a major impact from home staging. No one knows local homebuyer demographics -- and the home design elements that speak to each individual group -- better than a real estate agent. Working with a professional will allow you to hone in on a targeted staging plan that resonates with your buyer audience. Color can have as much of an impact as anything. In most metropolitan markets, staging is starting to lean toward vibrant, eclectic colors rather than bland neutrals. The right color choice depends on the type of home your selling, your price bracket, and the average age of your potential buyers. The one universal rule of color is that you should choose photogenic hues. The wrong shades of red, for instance, can look terrible in online photos and potentially undo the hard work you’ve put into staging. Contact the Neir Team for Professional Staging Advice! Whether you need assistance picking decor, selecting colors, or finding out how to target a home staging plan to a particular type of buyer, The Neir Team can help you through the process. 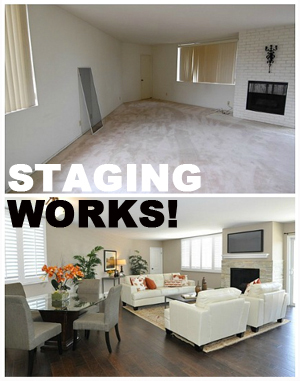 Contact us today to learn more about how home staging can make a difference for you! I think, home staging is more than just the usual to-do list of pre-selling activities â€“ more than just the necessary repairs, decluttering, and storing personal items. Staging broadens the appeal of the house to more buyers by selling a lifestyle.